I hadn't planned on doing a Koufax card anytime soon, however, Night Owl had a great post last night about what to do with your collection when the Grim Reaper is drawing near. I thought his post was very insightful, if morbid, and I thought I'd return the unbeknown favor with a custom Dodger card for him. I was pretty sure Topps only gave Sandy the usual highlight or leader cards for 1967, but after reading his 1966 stats, I had to double check for a base card. Sure enough, no base card. When you read his stats at the bottom, you'll know that Topps WAS OUT OF THEIR MINDS not issuing a 1967 version. This leads me to believe that maybe Topps no longer had/has rights to print cards of retired players. 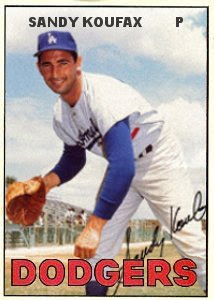 Koufax's last season was unbelievable. Definitely hard to see that career end, yet if my memory serves me right, he was having arthritic arm troubles. I'm starting to feel like a one trick pony! i used the exact same photo for my 1967 topps card that never was for a future post! nice work! i recently read jane leavy's koufax bio, and it helped me understand just how badly his arm was hurting - it wasn't a sudden injury or decision to retire on his part. It's so odd to see Sandy happy on his "final card." I always associate his final card with the 1966 set, in which he's kind of glum-looking. As a kid I thought Sandy was glum because his arm was hurting and he was thinking about quitting. So this puts a nice happy ending on his career. Thanks!